Glut: a year in my patch: Growing tips needed! I need your growing tips, you see today I received a package from my lovely brother and it contained these! I don't even know what they are called but my brother who is married to a New Zealander says that they are some sort of yam and Kiwis love them and find them hard to find in Australia. 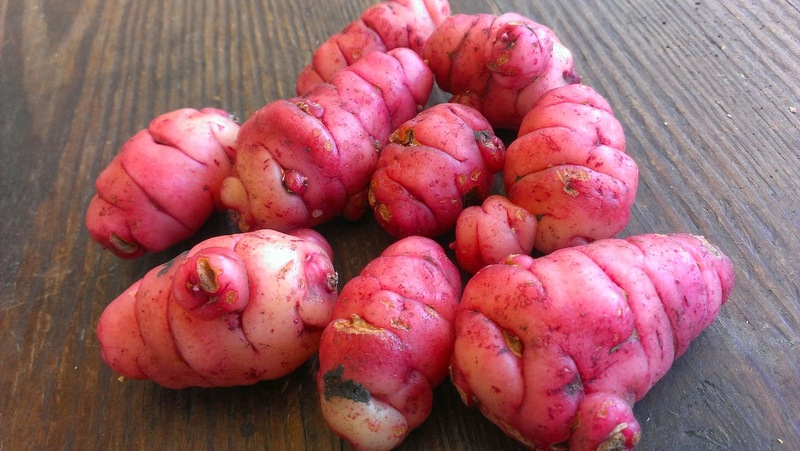 As with such things, they may or may not be from NZ , they may or may not even be called NZ yams. Such names are afterall often deceptive - Kiwi fruit are not a native fruit of NZ and Hawaiian nuts are not a native nut of that part of the Pacific they are in fact Australian nuts called Macadamias! Whatever they are called my brother found some in a market somewhere in Brisbane and suggested I should try growing them, and that's exactly what I will try to do. But I need your help. I am at a bit of a loss and not knowing what they are called makes it impossible to Google. They kind of look like red Jerusalem artichokes or galangal roots but they don't have the odour of either of these. How do they grow - onthe roots of a vine like a sweet potato, on the roots of a bush like potatoes, or on the roots of a stout stalk like Jerusalems? Any growing tips - soil ph or similar? Do you grow them? What do they taste like? What new things are you growing this year? Yay! Fantastic, thank you! BTW I am enjoying the series on Home Diary. As you may know I have three Dexters - one new one with a calf at hoof and another in-calf, due November. I havent been able to milk the new girl yet - she's still a little shy about us... but I have handled my cow who is in-calf and she is very used to me. I cant wait till she calves. And I must start halter training the little calf Hazel. Did you make your halter for your little girl or can you buy them? Having no experience with yams I wont comment except to say that I find them very aesthetically pleasing. They are pretty aren't they? They are called yams here in NZ, They originally came from Chile I think, anyway the Andes. To go them plant them as you would potatoes, let them sprout first, they will need to stay in the ground a long time till next winter in fact. You harvest them when the tops die down, no good trying before as the tubers dont form till winter. You get about a kilo from one tuber. I have a post about recipes for them on my blog: http://sharonspatch.blogspot.co.nz/2012/07/venturedout-into-garden-to-see-what-i.html. They are delicious! Wow Sharon, perfect! Thanks for the tips and recipe. The Andes hey? I wonder if they will be able to tough out our hot summers? Under a shade cloth perhaps? She grows them, pickles them and uses them as snacks. She gave me sone to grow but I didn't have much luck with them. Must get back there and try again. Thanks Frogdancer, I will check it out. Yes I'm a NZer and we call then yams. They are sort of like sweet potato but more of a watery texture. We always have them roasted, I'm not esp fond of them but some of my family LOVE them. I have no idea how to grow them!